Typically the reason for a yardage discrepancy is because running plays are not being recorded correctly. When you press Run on the main scoring screen, by default you are presented with a standard handoff/run/tackled play. When users report that yardage is off, this is generally because they drag the second icon (the handoff icon) down the field which makes iScore think the handoff occurred downfield and assigns the yardage as if this was the case. For a typical running play, simply drag the Tackled icon to the correct spot on the field (or double tap the correct spot on the field to have it move there automatically). 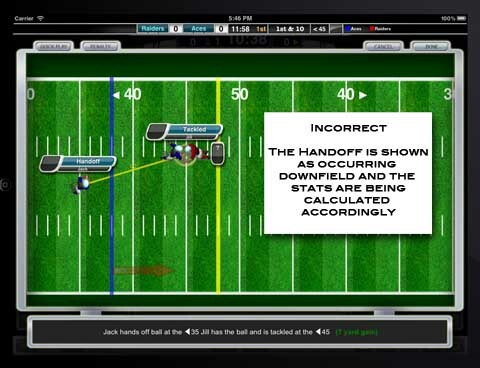 To correct existing plays where the play was scored incorrectly, select the game from Game Manager, press the Play by Play item in the Game Info screen and tap Edit on an incorrectly scored play. Press Quick Play in the top left of the Play Edit screen and select "Handoff,Run,Tackle". 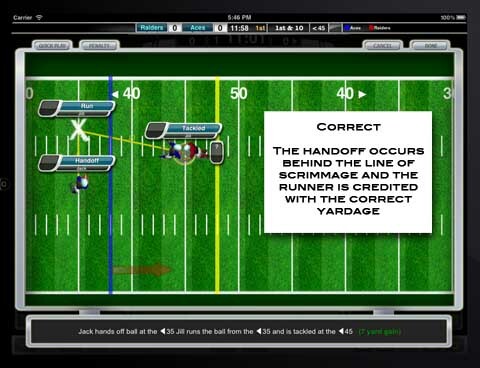 Now place the Tackled icon in the correct spot and leave the handoff icon behind the line of scrimmage and the stats will then be correctly calculated. Also be aware that according to the statisticians guides for NCAA and NFL, the yardage gained / lost on a conversion attempt by a runner / passer do NOT count toward their total stats for a game. You will see the gain/loss in the play by play listing, but when calculating the total statistics, these numbers are not included. This is the correct way to calculate these totals, but some people are not aware of this rule and are confused when PATs do not contribute to stats totals. No rushing, passing, receiving, interception, fumble or sack statistics shall be credited during an extra- point attempt. However, penalty yardage, if assessed, is recorded as if during a scrimmage down. Article 4. The extra point is attempted while time is out and is not to be recorded as a play from scrimmage (i.e., rush, pass, interception or kick). Exception: Penalties against Team A and Team B are recorded.